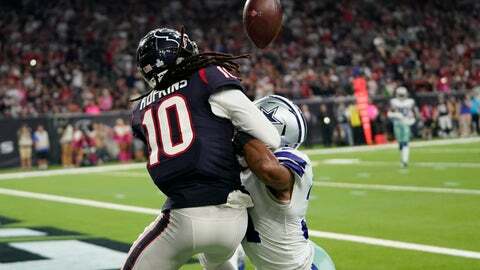 HOUSTON (AP) — When DeAndre Hopkins had a chance to make a play in overtime on Sunday night against the Dallas Cowboys, Houston’s star receiver was intent on redeeming himself after losing a rare fumble in the third quarter. He did that with a spectacular 49-yard catch and run that got the Texans in scoring range, and Ka’imi Fairbairn kicked a 36-yard field goal to lift the Texans to a 19-16 win. Coach Bill O’Brien said Hopkins approached him after the fumble and simply said: ‘I’ll make up for that.’ Watson knew he would do that when he threw the ball his way. “We just felt like at that point in the game, the way our defense was playing, the idea was to pin them down there,” he said. It is Houston’s first win over the Cowboys (2-3) since the team’s first game on Sept. 8, 2002, ending a three-game losing streak to Dallas. The Texans (2-3) did it in front of a franchise-record crowd of 72,008, which was peppered with plenty of Cowboys fans. Houston defensive end Jadeveon Clowney didn’t realize the Texans hadn’t beaten the Cowboys in 16 years, but did understand the importance of the victory. Dak Prescott had 208 yards passing and a touchdown but threw two interceptions for the Cowboys. Elliott, who entered the game as the NFL’s leading rusher, was limited to 54 yards rushing. Prescott’s second interception came when Johnathan Joseph broke up a pass and rookie Justin Reid caught it just before it hit the turf in the third quarter. The Texans drove to the 3-yard line on the ensuing possession before the drive stalled and Fairbairn kicked a 21-yard field goal to tie it at 13-13. The Texans drove to the 2-yard line later in the second but Watson’s pass on third down fell incomplete and they settled for a 20-yard field goal to push the lead to 10-6. Houston RB Lamar Miller, who dealt with a chest injury this week, was active but did not play. … Texans CB Kayvon Webster left the game in the first quarter with a quadriceps injury and didn’t return. He had previously said he didn’t like that song because he was tired of everyone singing it to him but seems to be past that now. “I just gave the people what they wanted to see,” he said with a laugh.